Even though we know that this company never really followed any trends, they were the trendsetters ever, however, things change and this time it seems that Samsung will join in the notch trend. The company prepares to soon implement the notch into their devices. 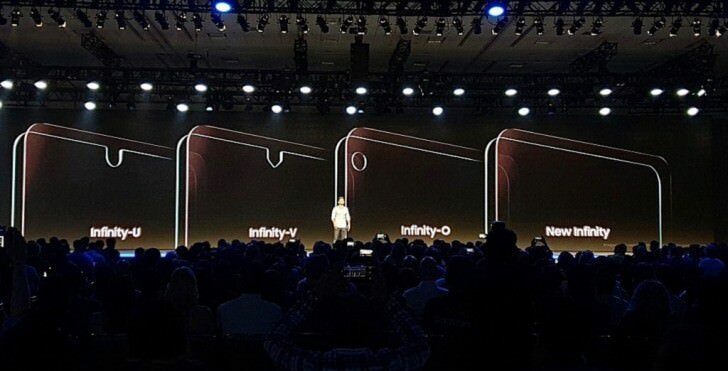 On their annual conference, among everything else, Samsung presented three new potential design solutions – Infinity-U, Infinity-V and Infinity-O. Infinity U uses a design that, at least on this photo, seems identical to the notch on the Essential PH-1 device. Infinity V has similar concept but a sharper looks to it. When it comes to Infinity-O, there isn't a typical notch there, rather a hole in the dislay that houses the front facing camera sensor alongisde all other sensors. The "New Infinity" desing doesn't even have a notch, which points to the possibility that Samsung's developing a way to store the camera and sensors in an atypical location. This is quite bad news for Samsung fans who stuck to their devices primarily because they resisted the pressure of implementing a notch design.